The app requires a daily download, which updates you with the entire day's news and allows you to read it offline. A new download is available in the App Store every day from 5 a.m. BST (that's midnight Eastern). 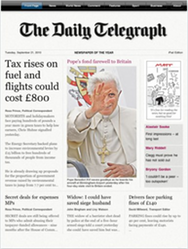 For a limited time, The Telegraph for iPad—which requires iOS 3.2 or later—is available for free thanks to a partnership with Audi. Details on pricing after that are unavailable.